"Our mission is to build social awareness and to provide opportunities to children who are the most vulnerable," Eva Stephanus, co-founder, Art Makes You, says. 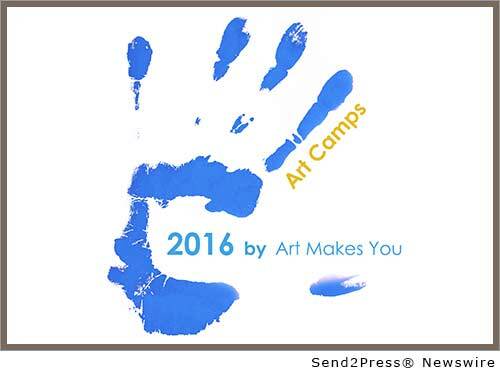 SEATTLE, Wash., April 1, 2016 (SEND2PRESS NEWSWIRE) — Art Makes You, a Seattle-based non-profit organization, is having its fourth fundraiser to raise money for its summer art camps for under-privileged children in the U.S., Latvia and Ukraine. The Art Makes You fundraiser will be held on Friday, April 29, 2016, from 5:30 to 8 p.m. at Neiman Marcus, 11111 Southeast 8th Street in Bellevue. Tickets are $100 per person. An additional $30 gives people access to an after-hours party. Its 2015 art camp hosted 70 children. This summer they hope to have 100 children participate in their special art programs. In 2013, the Art Makes You fundraising goal was $3,000. This year it is $15,000. Each year, the organization has grown to accommodate more and more children in need. Over the course of five days, these summer art camps expose children to multiple forms of media such as photography, painting, jewelry design, dance, drama and more. Led by professional artists, these camps not only serve underpriveilged youth, but they also work to bring communities together. “Our mission is to build social awareness and to provide opportunities to children who are the most vulnerable,” Eva Stephanus, co-founder, Art Makes You, says. This year’s art camp fundraising event begins with a red carpet entrance where attendees can have their portrait taken by a professional photographer. After that, they can proceed to enjoy a fun evening of live entertainment, drinks and delicious appetizers prepared by the chef at Mariposa, Neiman Marcus’s upscale, contemporary restaurant. Throughout the evening everyone will get the chance to experience the joy of art. They will have the opportunity to bid on one-of-a-kind, handmade items and participate in a silent auction too. VIPs can continue the evening, after-hours, in the Suite Lounge for a night to remember. All proceeds directly benefit Art Makes You Children art camps. For more information, visit: http://artmakesyou.org/new-events/, like them on Facebook: https://www.facebook.com/Art-Makes-You or watch a video about Art Makes You: https://vimeo.com/146430850. Founded by artists, Inese Westcott ad Eva Stephanus, Art Makes You helps orphans and children in need by exposing them to the power of creativity through various forms of art. They believe that creativity and art have the power to help children see beyond their circumstances. Since October, 2014, Art Makes You has inspired more than a hundred children to dream again. Original Keywords: Art Makes You SEATTLE Washington SEATTLE, Wash.
REFERENCES: Communication Arts News, Art Makes You SEATTLE Washington SEATTLE, Wash.